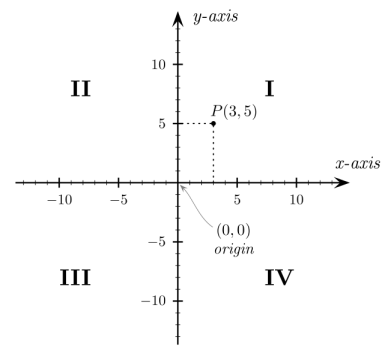 If you’re doing any work in 3D, you will need to know about the Cartesian coordinate system and transformation matrices. 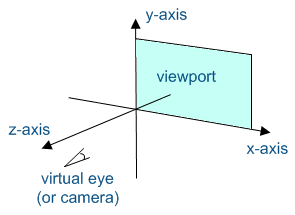 Cartesian coordinates are typically used to represent the world in 3D programming. 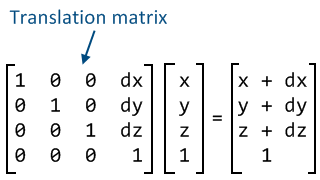 Transformation matrices are matrices representing operations on 3D points and objects. The typical operations are translation, rotation, scaling. I don’t quite like the way the z-axis points upward. 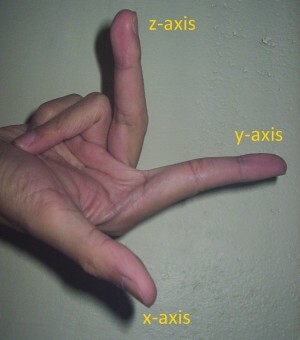 The idea probably stems from having a piece of paper representing the 2D plane formed by the x and y axes. The paper is placed on a flat horizontal table, and the z-axis sticks right up. Mathematically speaking, there’s no difference. We’re looking at the other side of the XY plane, but it’s the same thing. The z-axis points in the other direction. And yes, I have long fingers. My hand span can cover an entire octave on a piano. What’s the big deal? Because your 3D graphics engine might use a certain rule by default, and you must follow. Otherwise, you could be hunting down errors like why an object doesn’t appear on the screen. Because the object was behind the camera when you thought it’s in front. Your selected graphics engine should also allow you to use the other rule if you so choose. 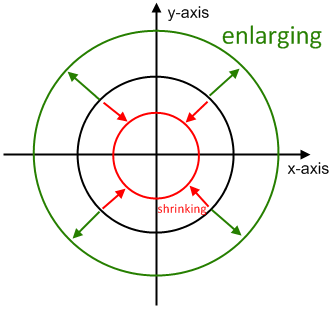 If your scaling factor is greater than 1, you’re enlarging an object. 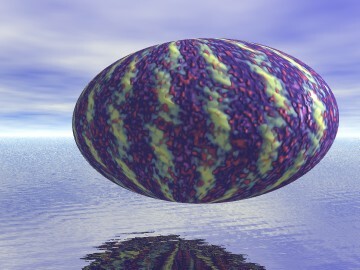 If your scaling factor is less than 1, you’re shrinking an object. What do you think happens when your scaling factor is 1? Or when your scaling factor is negative? 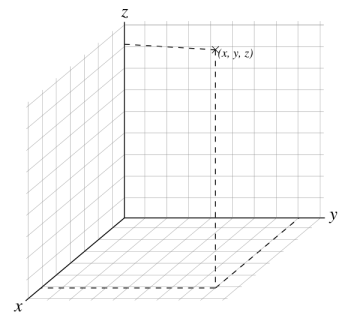 So how does the scaling factor look like in a scaling matrix? 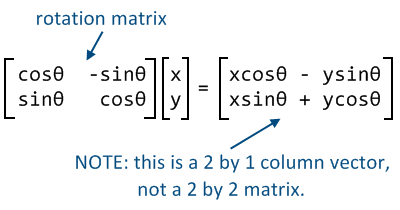 If you don’t know what that means, or don’t know what the result should be like, review the lesson on matrices and the corresponding program code. 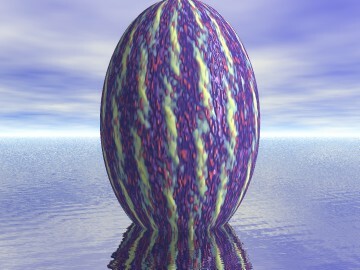 Yeah, I got tired of drawing 2D pictures, so I decided to render some 3D ones. Speaking of which, you should now be able to come up with the 3D version of the scaling matrix. Hint: just add a scaling factor for the z-axis. That symbol that looks like an O with a slit in the middle? That’s theta (pronounced th-ay-tuh), a Greek alphabet. It’s commonly used to represent unknown angles. I’ll spare you the mathematical derivation of the formula. Just use it. You can convince yourself with a simple experiment. 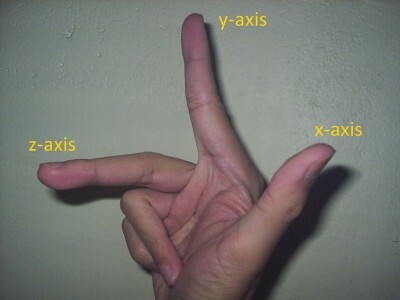 Use the vector (1,0), or unit vector lying on the x-axis. Plug in 90 degrees for theta and you should get (0,1), the unit vector lying on the y-axis. That’s anti-clockwise rotation. To rotate clockwise, just use the value with a change of sign. So you’ll have -90 degrees. Now for the hard part. The 3D version of rotation is … a little difficult. You see, what you’ve read above actually rotates about the implied z-axis. Wait, that means you can rotate about the x-axis! And the y-axis! Sacrebleu! You can rotate about any arbitrary axis! I’ll write another article on this. 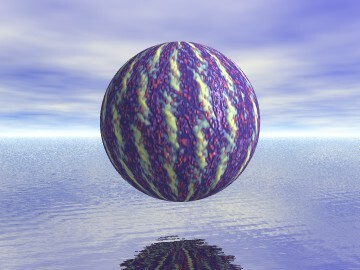 If you’re into this, then you might want to take a look at this article on 3D rotation. I’ll also touch on a concept where you rotate about one axis and then rotate about another axis. Be prepared for lots of sine’s and cosine’s in the formula. Stop weeping; it’s unseemly of you. The squiggly unstable looking d-wannabe? It’s the Greek alphabet delta. Delta-x is a standard notation for “change in x”. 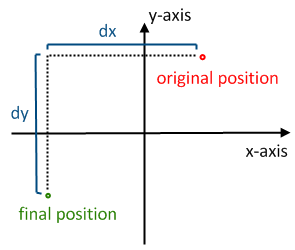 In this case “x” refers to distance along the x-axis. We’ll use an easier-to-type version called “dx” for our remaining discussion. 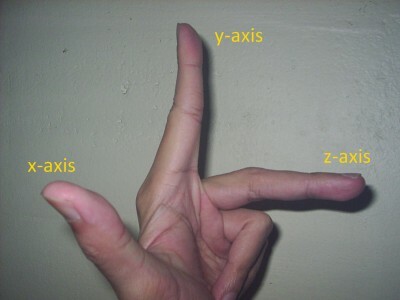 In 2 dimensions, we have the corresponding dy, for “change in y”. Note that there’s no stopping you from using negative values for dx or dy. In the illustration above, dx and dy are negative. You’ll have to imagine the case for 3D because the diagram is likely to be messy. But it’s easy to visualise. You just do the same for z-axis. So what’s the transformation matrix for translation? 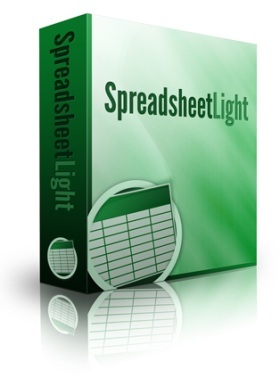 First, you need to extend your matrix size and vector size by one dimension. The exact reasons are due to affine transformations and homogeneous coordinates (I’ve mentioned them briefly earlier). Notice that for scaling, the important entries are the diagonal entries. For rotation, there are sine’s and cosine’s and they’re all over the place. But for translation, the “main body” of the matrix is actually an identity matrix. The fun stuff happens in the alleyway column on the extreme right of the matrix. That reminds me. Because you’ll be using all the transformation matrices together, all matrices must be of the same size. So scaling and rotation matrices need to be 4 by 4 too. Just extend them with zero entries except the bottom right entry, which is 1. We talked about 2D and 3D Cartesian coordinates. I’ve also shown you the right-hand and left-hand rules. 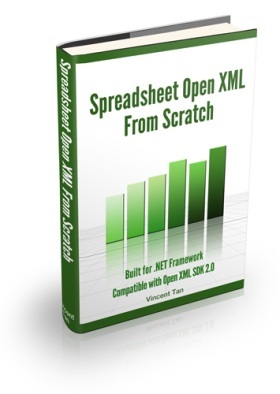 This forms the basis for learning basic transformations such as scaling, rotation and translation. There are two other interesting transformation matrices: shearing and reflection. I thought what we have is good enough for now. You are free to do your own research. When the situation arise, I’ll talk about those two transformations. You might find this article on converting between raster, Cartesian and polar coordinates useful. You might find these books on “coordinate transformation” useful.